For the second time this year, the UFC has broken its own record for the lowest Dwyer Score in its 413-event history. Back in June, the UFC’s Singapore event set the record low at -14, but this week’s show in Gdansk has scored even lower- meaning this weekend’s card contains fighters with the worst combined momentum in the promotion’s 24-year history. Donald Cerrone (32-9 MMA, 19-6 UFC) could match Michael Bisping’s all-time record of 20 UFC victories with a win over the undefeated Liverpudlian Darren Till (15-0-1 MMA, 3-0-1 UFC) on Saturday. Cerrone moved up to welterweight last year and finished his first four opponents in the new weight class- a winning streak that culminated with a KO victory over Matt Brown last December. Since then, Cerrone has lost back-to-back fights for the first time in his career, suffering an emphatic second-round TKO defeat to Jorge Masvidal in January before dropping a close decision to former champion Robbie Lawler in July. Till, who has faced a much lower standard of competition than Cerrone thus far in his career, spent a significant spell on the sidelines following a draw against Nicolas Dalby in a Fight of the Night performance back in October 2015. Till returned this year with two dominant decision victories against Jessin Ayari back in May and Bojan Veličković just last month. Each event, I calculate a ‘Dwyer Score’ for the card. It essentially gives a numeric value to the momentum of fighters competing at any one event. I do this by assigning a figure to each fighter’s current streak; a fighter on a five-fight winning streak contributes +5 to an event’s score, whilst a fighter on a two-fight losing streak contributes -2 to the score. A fighter coming off a No Contest, a draw, or a bout with another promotion has a streak of 0, and only UFC results are considered. 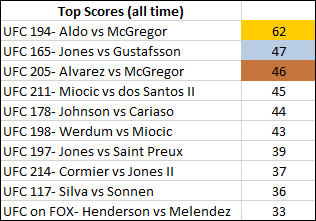 When you tally up the scores for every fighter on a card, you get a total for the event, the ‘Dwyer Score.’ This score does not claim to predict or measure the quality or excitement of any one card, but it does give you an idea of the general momentum of fighters heading into a specific event. Normally, I include a graphic here displaying some of the highest-scoring events of all time, but this week the table (above right) displays some of the lowest scores in UFC history. UFC Fight Night 118: Cerrone vs. Till has a score of -16; the lowest score in the promotion’s history. It’s the third time this year that an event has either equaled or broken the record for the lowest ever Dwyer Score, whilst last month’s Saitama event also appears in the all-time bottom 10. I believe part of the reason we’re seeing these kind of scores more regularly is the UFC’s reluctance to release fighters on losing streaks given Bellator’s recent propensity for snapping up free agents. A few years ago, a three-fight losing streak was a death sentence, whilst today fighters like Andrei Arlovski and B.J. Penn are kept around despite staring down the barrel of a sixth consecutive defeat. The highest individual contributors to the score are Darren Till and Devin Clark (both +2), with Sam Alvey and Lina Länsberg (both +1) the only other two fighters at the event coming off a UFC victory. The lowest individual scorers are Marcin Held and Anthony Hamilton (both -3), followed by Donald Cerrone, Karolina Kowalkiewicz, Jan Błachowicz, Jonathan Wilson and Warlley Alves (all -2). I don’t want to come across as being down on this card- Cerrone will go down as a legend of our sport, Till seems to have a big future, Kowalkiewicz can legitimately claim to be in the top 3 of her division and Lobov taking on Fili seems like a lot of fun. It’s just that, generally speaking, the fighters at UFC Gdansk aren’t necessarily in the greatest of form at the moment.